I hope everyone had a wonderful holiday season! I certainly did. I got to spend a lot of time with my family, which is always a good time. I even threw a 33 1/3 New Year’s Eve party (I played records all night – see what I did there?) which is the first NYE party I’ve ever hosted. It was small-ish, but still really fun. I kind of went overboard buying champagne, so I have three bottles in my refrigerator at the moment. Mimosas, anyone? 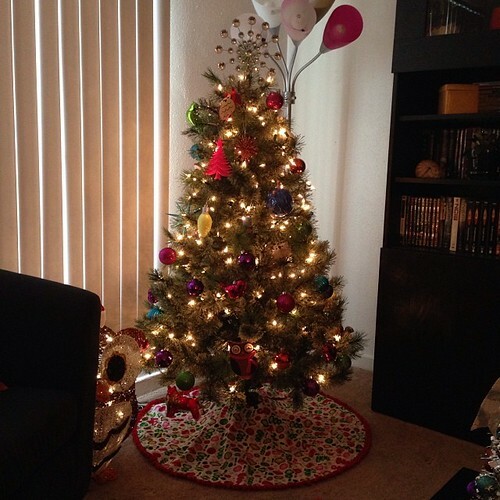 My roommate and I bought a little 4.5′ Christmas tree this year, and bought a bunch of cute ornaments for it. I also sewed a tree skirt for it. The tree was so adorable. We had sort of a Mid-Century Modern/woodland creature/bright colours theme going on. It worked, somehow. So, 2013 was a pretty good year overall. Jack had surgery early in the year, but he bounced back like a champ and has been doing incredibly well. The rest of the household critters are all healthy and happy, too. Vincent turned 5, which makes him the longest-living guinea pig companion I’ve had so far. Oreo turned 15, and she’s still a spunky, cuddly little beast. Sam, Jack, and Remy all made it in a pet calendar that my work put together. It was a contest, so they apparently won the hearts of the judges! Good job, guys. I stayed busy with arts and crafts, as usual. I made a lot of jewelry, including the jewelry for my friend Kasey’s wedding. It was such a fun project. I also got a little more involved in crocheting, so I made a few things – mostly items that were donated to charitable organizations. I also started fostering for Secondhand Hounds. I fostered a cat for a short while, and then fostered three rats. It was really fun, and I hope to foster other animals in the future. For my birthday, I got a Fitbit from my mum. It’s a fitness tracker, so it tracks steps, calories, and mileage. It also has a phone app that it connects to. I’ve been tracking my calorie intake and obviously my activity, and since August I’ve lost about 15 pounds. It doesn’t sound like much, but it’s a lot to me. I haven’t even increased my activity much — I do some weightlifting with resistance bands and hand-weights, but I’m not going to the gym or anything. So, based on that, it’s pretty amazing that I’ve lost weight by just changing up my diet a bit. I’ve cut out soda almost completely and drink it maybe once a week. I’ve been obsessed with sparkling water, so I’ve been drinking that instead of soda. I don’t miss soda at all. It’s weird that this tiny little device was just enough motivation and encouragement to keep me on track and make better choices regarding diet and exercise. I did buy a manual treadmill recently, but I’m still trying to get it calibrated and working properly. Hopefully I can sort that out soon and get some more walking in. Toward the end of the year, I also started seeing someone. After a 2+ years hiatus from relationships, it’s nice to have someone in my life again. He’s very kind, selfless, funny, and sweet. He’s also incredibly cute, but I could be a bit biased. I subjected the poor guy to meeting my family and the majority of my friends over Christmas and New Year’s, and he didn’t seem fazed at all. Everyone seems to like him, so hopefully this will all work out. He makes my heart happy. My goal for 2014 is to get my driver’s license and get a car. I’d also like to get my Security+ certification. I hope to create more art and try and get into some more art shows. I’d like to hug a wombat and swim with dolphins, too, but I’m trying to be realistic for 2014.